Hackathon winners Team Ethyl. From left: Ryan O'Shea, Sharan Juangphanich and Chris Blackwood. A wearable device that could help recovering alcoholics won first prize at the Stevens Venture Center’s first Digital Healthcare Hackathon, a multi-day event that brought together innovators and budding entrepreneurs eager to solve critical challenges in medicine. Participants worked in teams to brainstorm prototype apps and also attended discussions and workshops. Team Ethyl — Chris Blackwood, Ryan O'Shea and Sharan Juangphanich — shared $5,000 for their proposed wrist-worn device, which allows a community of friends and fellow former substance abusers to help track and support the wearer during the recovery process. The members of Ethyl were among 10 teams of two to six students, technology experts and health professionals who participated in the hackathon. 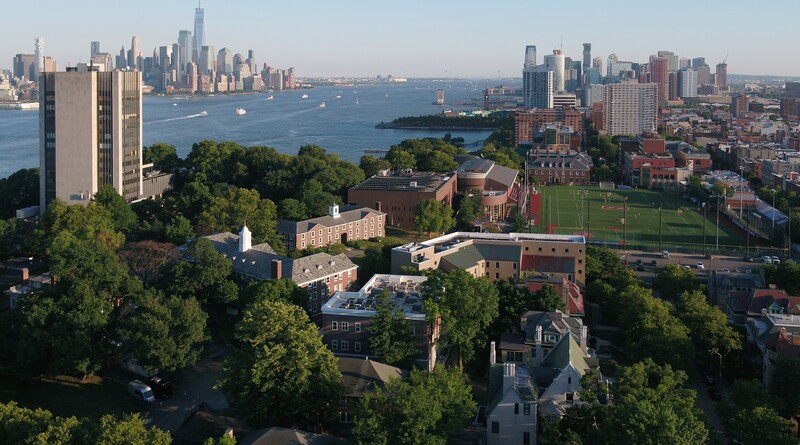 The event, which took place October 6-8 on the university’s Hoboken, N.J. campus, brought entrepreneurs and healthcare innovators together with mentors and experts for a weekend of brainstorming sessions, workshops, talks and networking opportunities. More than 130 people ranging from high schoolers to students at Stevens and other institutions to mid-career professionals applied for the 50 hackathon slots. The SVC organized the hackathon as part of its mission to promote the development of new technology-oriented businesses and to help build on Stevens’ culture of innovation and entrepreneurship. Participants attended workshops on development and prototyping, big data and healthcare, how to pitch business ideas and raising seed capital. But the focal point of the weekend was a series of hacking sessions in which teams worked to solve a specific healthcare issue. Teams could choose to work on one of two areas: digital solutions to improve medication compliance or telemonitoring/telehealth solutions to improve patient access to diagnosis and treatment. The hackathon cultminated in a pitch competition, in which the teams presented their ideas to a panel of judges that evaluated their technological and business viability and awarded a total of $10,000 in prizes. Sharing in the prize money: Team Lux, which took second place with a proposal for an application that helps patients adhere to their medication regimens; and Team Diagnose.me, which won third with its plan for a prediction platform that utilizes machine learning to accurately diagnose people based on demographics and their basic health information. Other teams delved into issues such as diagnostics, legal compliance by medical companies and methods for helping doctors, patients and caregivers share important information. The members of Ethyl said the hackathon was just the first step in their plan to develop their wearable and bring it to market. “We took this opportunity to solve a problem that is very important to us, and the hackathon provided a great opportunity to refine the idea while meeting some great people,” Blackwood said. “We plan to continue working on this project with the Stevens Venture Center to turn it into a real business, with the hopes of helping real people conquer their addiction to alcohol." The weekend also included a dinner attended by about 100 people, plus a keynote address by Paul von Autenried, the senior vice president and chief information officer at Bristol-Myers Squibb, and a kickoff speech by Jarrett Bauer, the CEO of Hoboken-based Health Recovery Solutions and a member of the Forbes “30 Under 30” list. Dr. Donald Lombardi of the Stevens School of Business served as master of ceremonies. Choma organized the event in conjunction with Premal Kamdar, ’13 Bioengineering, a healthcare entrepreneur who recently completed a digital health innovation fellowship at the Texas Medical Center, and his brother Vishal Kamdar of the investment banking firm Evercore. The team behind the event also included students Austin Cawley-Edwards and Francesca Bueti, and Professor Mukund Iyengar of the Department of Electrical and Computer Engineering. SVC was joined in presenting the event by the Business School and the Department of Computer Science in the Charles V. Schaefer, Jr. School of Engineering and Science. In addition, nine organizations signed on as sponsors: Bristol-Myers Squibb, CarePoint Health, Gibbons P.C., Greenberg Traurig, Hackensack Meridien Health, Health Recovery Solutions, Lowenstein Sandler, New Jersey Innovation Institute and Quest Diagnostics.